Lastolite's TriFlector 2 is a popular choice for those involved in makeover and fashion photography as the three TriFlector panels on a lighting stand with an overhead light give the subject's eye's a distinctive sparkle. The three Triflector panels have individually adjustable hinge mechanisms which enable you to focus the light exactly where you need it, and fold away when not in use, fitting neatly into a portable bag. 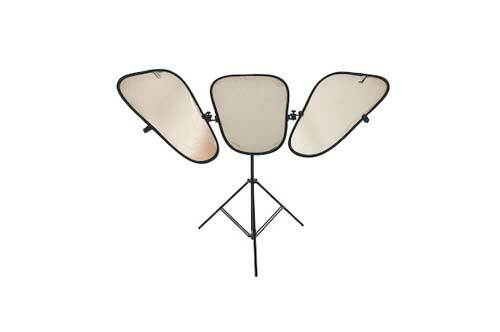 Supplied with Silver/White panels it can be used handheld or fitted to an lighting stand (not included).